Ingrid’s Elegant Voyage begins with three nights at the exquisite Londolozi Private Granite Suites. Offering an extraordinary experience for the exclusive use of six guests, the suites seamlessly integrate with nature courtesy of large doors and windows that open directly onto the Sand River. From the borders of the Kruger National Park to the grasslands of the Kalahari and the foot of the Korannaberg mountains, the second leg of this voyage takes the shape of three nights at Tswalu Motse. Accommodating a maximum of only 30 visitors in it’s nine spacious and secluded ‘legae’, Tswalu Motse is where barefoot luxury meets one of the continent’s best-kept secrets. Next on the itinerary? The Mother City, where you will spend four nights at the luxurious Ellerman House. Perched on the slopes of Lion’s Head in the prestigious Bantry Bay residential area in Cape Town, Ellerman House offers visitors luxury, refinement, exceptional service and front row seats to the best that this incredible city has to offer – scenic beauty, celebrity beaches, Table Mountain, whale-watching, world-class shopping, nightlife, food and wine, and a laid-back atmosphere. After your stay at Ellerman House, you will journey up the coast to the seaside town of Hermanus where a two-night stay at Birkenhead House awaits. With an exhilarating cliff-top position overlooking the whale watching paradise of Walker Bay, Birkenhead House is an iconic showcase of South Africa’s finest hospitality, cuisine, wine and leisure. The final leg of Ingrid’s Elegant Voyage takes you to &Beyond Benguerra Lodge off the coast of Mozambique, for an idyllic island getaway. Set in a protected marine conservation area, this piece of paradise boasts pristine beaches and unspoiled coral reefs teeming with marine life. It’s a picture-perfect end to an unforgettable 17-day adventure. A short shared chartered flight from Johannesburg guests will fly guests to the unforgettable, breathtakingly beautiful Londolozi Private Granite Suites situated in the big 5 game reserve of the Sabi Sands, where they will spend the next three nights in luxury. Yet it’s the leopards of Londolozi that make them world famous for wildlife, and lie at the heart of the Londolozi feeling. Over the course of three decades, a unique relationship has developed between their rangers and trackers and generations of wild leopards. Intimate leopard sightings are frequent here, an experience that their guests agree is a pinnacle life experience. Londolozi’s Private Granite Suites offer an extraordinary experience for the exclusive use of six guests. The lodge is flanked by an extrusion of granite rocks, an effect echoed by the décor’s bold materials and silver, charcoal and elephant grey palette. The suites convey Africa’s raw essence with a contemporary and elegant flavour. At Granite, the emphasis is on space, light and privacy. The Suites blend the boundaries between inside and outside, creating a seamless integration with nature with large doors and windows opening directly onto the Sand River. Each Suite has a private, heated swimming pool. This luxury safari lodge is for the discerning traveller who appreciates the finer details. The Suites can be booked individually or as a private camp for six guests, making it ideal for honeymooning couples or small groups celebrating special occasions. This lodge does not accommodate children under the age of 16. A shared chartered flight will fly guests to the unforgettable, breathtakingly beautiful Tswalu Motse situated in the Tswalu Kalahari Game Reserve, where they will spend the next three nights in luxury. Tswalu Kalahari is South Africa’s largest private game reserve, now protecting over 110,000 hectares of spectacular grasslands and mountains. While the malaria-free Tswalu is home to most of the “charismatic” African big game species such as lion, cheetah, wild dog, desert black rhino and buffalo, Tswalu has developed into a vast area of unique biodiversity and natural beauty which offers safe haven to a number of rare and endangered species, including pangolin, aardvark, aardwolf, African wild dog, rare antelope such as roan, sable and tsessebe and endangered raptors. The Motse, lies at the foot of the Korannaberg mountains facing westwards across the grasslands of the Kalahari. Motse means “village” in Tswana, and this village consists of just nine spacious and secluded “legae” (Tswana for “little house”). The Motse accommodates no more than 24 guests at any one time to make for a truly intimate Kalahari experience. The main house is a spectacular space in which to meet, with its elevated decks and elegant lounges. An infinity pool offers an endless view over the savannahs, and a secluded spa is designed to complete your total relaxation. The mezzanine library is equipped with satellite TV (the Motse also has full broadband Wi-Fi access throughout) and its museum cases display rare artefacts from the area. The Malori sleep-out deck offers couples or families the unique opportunity to sleep under the Kalahari night sky. For complete privacy and exclusivity of the safari experience, every booking receives a private vehicle, guide, and tracker. This allows for total flexibility and a personalised safari plan offering with no set game drive times. A customised safari plan means that Tswalu has no set meal times and therefore caters to guests at their pace without impacting on their safari experience. Tswalu welcomes families and actively encourages children to participate fully in the safari experience with a specially designed Junior Rangers Programme. After breakfast guests will fly directly to Cape Town International Airport, from where they will be transferred to ever so elegant Ellerman House. Ellerman House is the quintessential urban retreat for discerning luxury travellers wanting complete exclusivity in Cape Town. Located in Bantry Bay, the small, privately owned hotel offers spectacular Atlantic Ocean views against the dramatic backdrop of Lion’s Head. Clifton’s sheltered beaches are within walking distance, while local attractions such as the Table Mountain Aerial Cableway, Camps Bay, and V&A Waterfront are 10 minutes by car. Originally a private residence, the historic Cape Edwardian-style mansion features shaded verandas and terraced indigenous gardens overlooking the ocean. There are 13 individually decorated rooms and suites complemented by two ultra-modern villas. The natural splendour of the hotel’s unique location is matched by generous-hearted South African hospitality, exceptional cuisine that reflects the best of local and seasonal flavours, and a vast collection of local vintage wines. A resident sommelier offers private tastings and wine pairings to complement a daily menu of modern classics. Guest privacy is a top priority in this exclusive environment, and the hospitality team prides itself on individualising every aspect of the experience and tailor-making excursions. A highlight of Ellerman House is the owner’s extensive South African art collection spanning original works from the turn of the last century to current contemporary art, a separate collection of which is displayed in the Ellerman House Contemporary Art Gallery. Villa One incorporates the tranquil Ellerman House Spa, which specialises in cutting-edge massage techniques, anti-ageing beauty treatments and hydrotherapy. Villa Two is built above the Ellerman House Wine Gallery, which is not only a spectacular cellar for the hotel’s 7500-bottle wine collection but offers an interactive, experiential journey into the world of wine. From the very best of local design and art to cuisine, wine and hospitality, Ellerman House strives to offer a world-class guest experience that remains authentically South African. 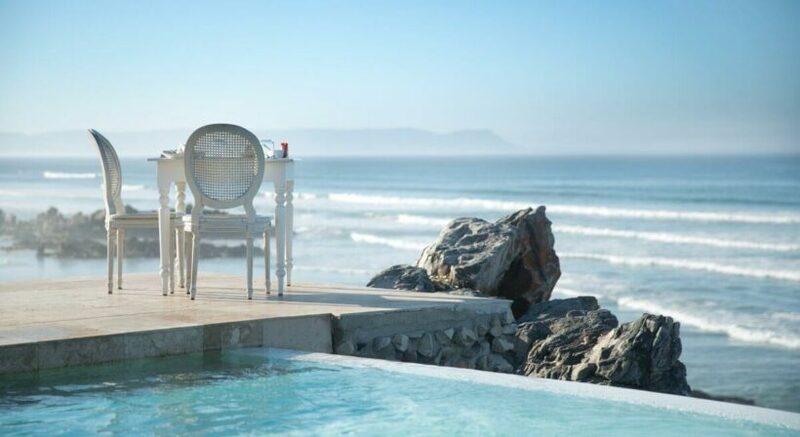 A short transfer by road will take guests to the impeccable Birkenhead House where they will relax and indulge in the beauty of Hermanus for the next two nights. From its stunning clifftop position in the town of Hermanus, Birkenhead House enjoys exhilarating ocean views and close proximity to the beach. Breezy beach house style is mixed with contemporary artwork and opulent furnishings to create an elegant and inviting environment. Eleven suites with either sea or mountain views offer the height of comfort and luxury: balconies, underfloor heating and huge bathtubs allow guests to make the most of their stay, whatever the weather. Spa, pool and gym offer the chance for indulgence, relaxation or exercise. Cliff and beach walks are an invigorating way to take the air but numerous sporting and leisure activities are available in the area, from golf to shark-cage diving. Whale watching, for which Hermanus is famed, can be done from the hotel from June to November, with September the height of the season. After a sundowner overlooking the ocean, the freshest seafood and most delicious international cuisine can be enjoyed. From morning coffee and cake to hot chocolate beside the fire, there is always something delectable on offer. a short helicopter transfer to the world class, breathtakingly beautiful Benguearra Island resort where they spend the next 4 nights. An exquisite piece of paradise in the middle of the Indian Ocean, &Beyond Benguerra Island is a luxury beach holiday destination where time stands still and legends come to life. Situated on the second largest island in the sunny Bazaruto Archipelago off the coast of Mozambique, the lodge is set in a protected marine conservation area and offers pristine beaches and unspoiled coral reefs teeming with marine life. Looking out onto a sandy beach and set on a deep lagoon unaffected by the tides, this exclusive beach getaway is ideal for swimming and snorkelling. Surrounded by premier diving sites, the lodge is the gateway to an underwater wonderland for divers, with a rich variety of tropical fish species complemented by Africa’s only population of the rare dugong. The deep Mozambique Channel, which runs alongside the island, is renowned for its game fish and Benguerra Island offers some of the world’s best catch-and-release deep sea fishing and fly-fishing opportunities. An idyllic luxury island getaway, &Beyond Benguerra Island lies sheltered within a canopy of indigenous casuarina pine forest, which opens up to panoramic views of the Indian Ocean. Looking out onto the calm waters of a secluded bay, the lodge boasts soft, shimmering beach sands, as well as a deep channel that cuts straight out to sea, allowing for swimming right off the beach even at low tide and permitting direct boat access. The welcoming guest areas offer views of the lush tropical garden and the ocean beyond. Set deep in cleverly created patches of shade, comfortable loungers beckon set around the lodge’s rim flow swimming pool look out onto the waves. Colourfully ornamented, a traditional wooden dhow has found its final resting place on the beach, offering the ideal spot to indulge in an ice-cold cocktail or a delicious meal of fresh, fragrant seafood. After days filled with discovery, weary muscles relax and recharge under the magical attentions of the masseuses in the massage sala. After a holiday of a lifetime, guests will fly back to Johannesburg from where they will get a connecting flight back home.